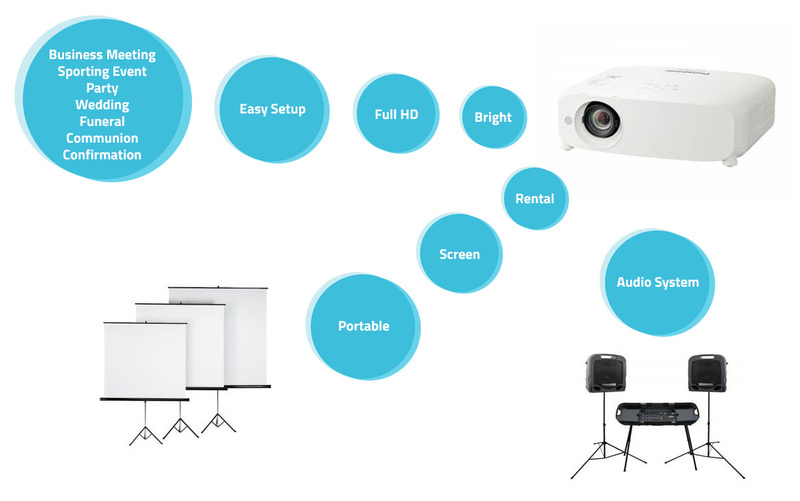 Projector Rental from ACE – from 55.00 plus vat@23%. Hiring a projector from ACE starts at 55.00 + vat@23% = 67.65. We are a leading Dublin projector & screen rental company, hire daily, weekly, monthly or longer. Make your event really come alive! Our projectors are all full HD machines from the leading manufacturers & have the latest technology installed to give great picture quality whether making presentations or showing films. You can be assured that all our focus is solely directed at ensuring your experience is as productive as possible. Can’t pick up – we deliver/collect & offer setup for you. We will provide helpful & friendly advice on choosing the correct combination for your event, on set up & on correct connections for best possible picture quality. You may only require a screen – yes, we have tripod screens from 160cm to 240cm for rental. Require audio with your presentation or film, we have active speakers for the smaller venue or a portable PA system with wireless microphones for the larger audience.